Click on the photos for closer views. 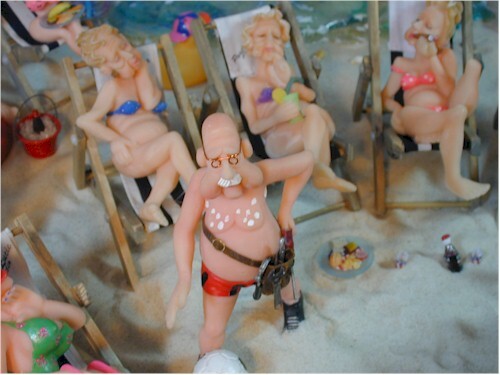 This beach scene started out as a joke. Grace had gotten a couple of resin dolls that are sold in Port St. Lucie, FL as souvenirs. 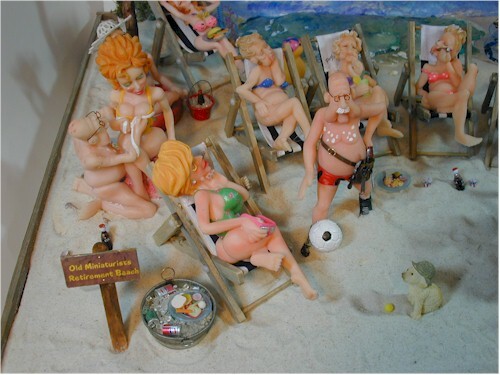 Three were "old" ladies sitting in beach chairs, and one was an old man. The male doll represents her husband, Jim, whose CB name was "the stud" because he is a carpenter. As a joke, she decided to get one more doll with "big bozooms." Jim would be staring at the "big bozooms." The three "old ladies" were to represent Grace and two for her trade group. One of the ladies, is saying, "Oh look! Papa Jim thinks he's a stud again!" But, as the way of so many mini projects, this one started to mushroom. One of Grace's other trade friends said she had a doll to represent herself, so she sent it to be in the scene. Then another friend sent her a couple more dolls. One of the husbands had to get into the act and sent Jim the couple with the man "measuring" the ladies "bozooms." So, this scene evolved. 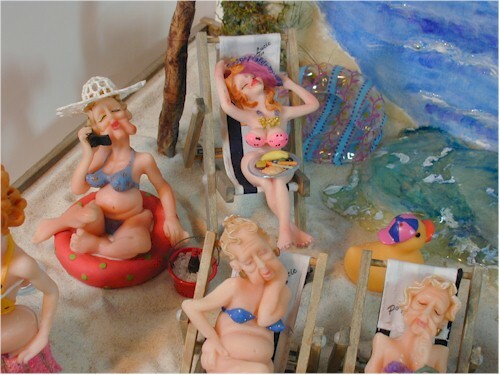 After doing some research in 8/2008, Grace finds that the Beach Lovers/Sunbathers are no longer made, so if you see them anywhere, snap them up! I have found a few that I am selling on my Figures page. When these are gone, that will be it. This view is of the whole scene. Grace painted the background of the scene in relief. The sand dunes actually have grass made from cat whiskers. 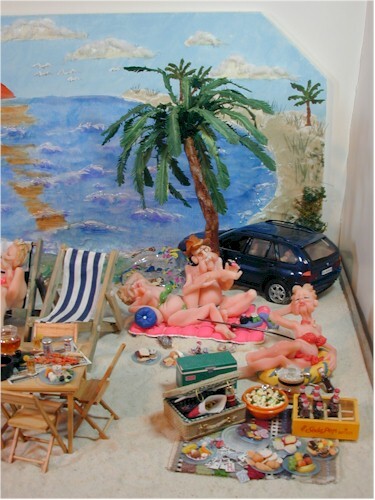 She made the palm trees and put the car kit together. This view shows the right side. This is shows the left side. Please note the couple in the background fishing. Grace's cyber-daughter sent her a birthday card with the old couple fishing. She said, "Let's see you incorporate this into your beach scene." Look closely at the fishing couple, Chryssa. 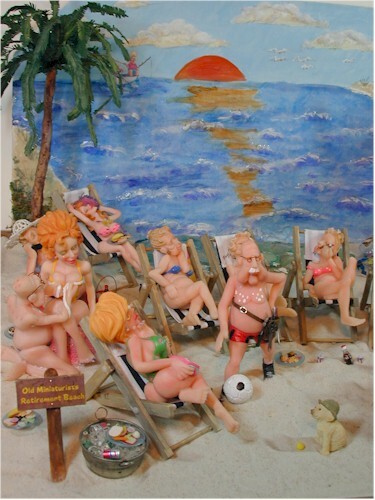 Note the "Old Miniaturist Retirement Beach" sign in this view. with a little help from Marlene Smith. 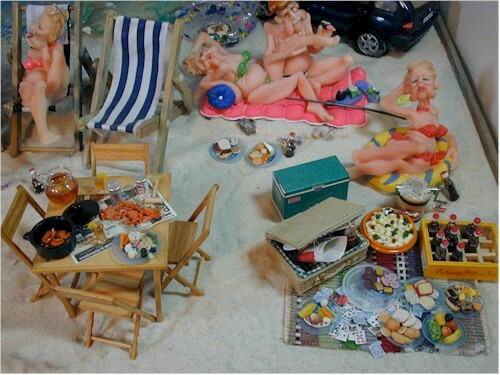 Below are more photos of the foods the "Old Miniaturist" too with them. 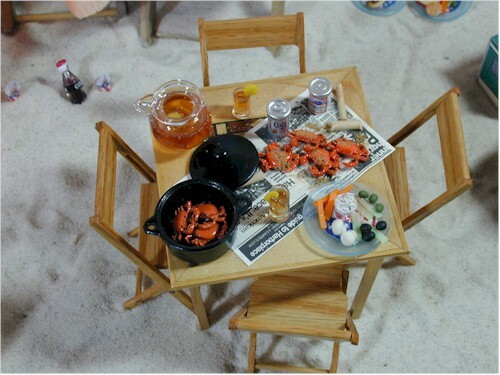 Not sure who made the crab pot and crabs. But look at the great potato salad Alice made. Makes me hungry just looking at it. crabs on a newspaper. The crabs on the newspaper are exclusively from Favorite Things in MD. 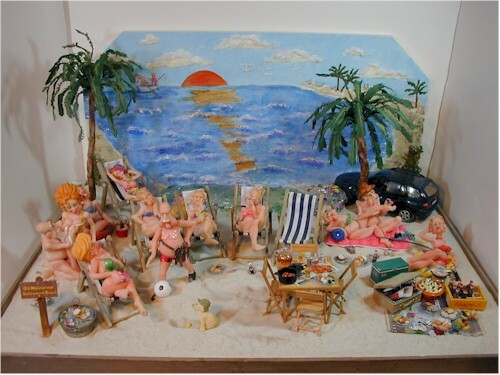 The folding card table and chairs were made by Tom Wolfert of Mayberry Miniatures. The cooler is a printi from Jim Collins site, www.printmini.com. 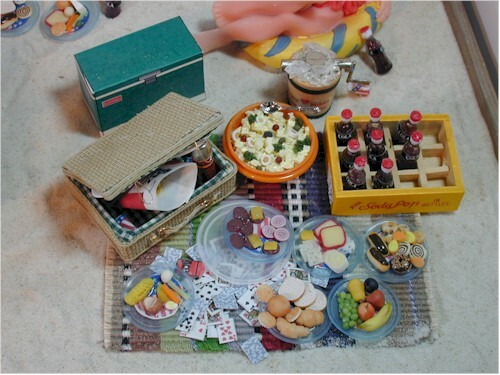 The picnic basket was a kit by Roz Weitzman. The tool belt Papa Jim is wearing is by Shirley Peterson of Prestige Leather. Hope you enjoyed your trip to the beach. 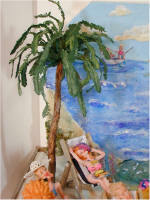 Don't forget to look at other scenes by Grace, including her dollhouse, Dogwood Manor. 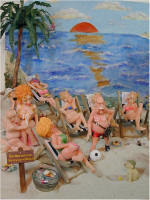 Below are some more views of the beach scene, including some close-ups of the figures. Papa Jim & his tools. Old gent measuring girls "bozooms."